Been thinking about trying the lemon diet? Everyone knows that drinking warm juice made from lemons is for detox. There is more to the lemon diet than drinking lemonade. It turns out that the best time to take advantage of lemon nutrition and benefits is in the morning. That is why in this lemon diet, we introduce a simple lemon detox recipe to get your diet on the road along with benefits of lemons for enhanced health and weight loss. When there are so many other diets out there to try, what makes the lemon diet special? - There are many flavors to "the lemon diet." You've heard them all. Lemon cleanse diet. Lemonade diet. What's the difference? - Besides the name, there isn't much. The secret to why the lemon diet work is in lemon nutrition. See how you can start on the lemon diet today. How the lemon detox diet works is all you have to do is drink warm lemon juice in the morning to unlock the benefits from drinking lemon juice in morning in your diet. Enter the lemon detox diet. It's easy to get lost in different variations of the lemon diet including the lemon diet cleanse, thee lemon cleansing diet, and the lemon diet detox. Why does it all have to be so confusing? - It doesn't have to be. 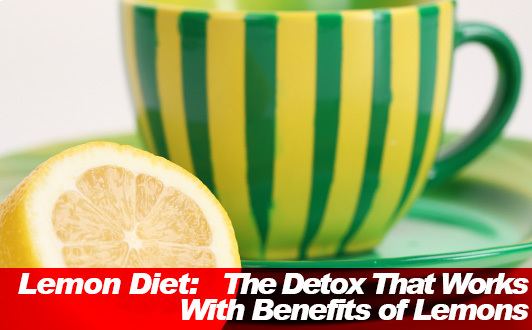 Here is a quick recipe to kick off your lemon detox right away. Relax. This lemon juice diet recipe is probably the easier you are ever going to hear. Unlike, other lemon juice diets such as Beyonce's lemon syrup or master cleanse, there is no need to feel like you are going way over your head on this. Similar to the fresh fruit cleanse introduced previously, this lemon detox recipe is as easy as mixing it up. Drink a glass of warm water mixed with freshly squeezed lemon juice in the morningbefore doing anything else. The benefits you get out of eating lemons in your diet don't stop at weight loss. In addition to helping you lose weight, what you get is a boosted immune system, better digestion, a natural cleanse, anti-inflammatory pain relief, smoother lymph circulation, and lower cholesterol to support your lemon diet. Vitamin C in lemons does your immune system good by giving you the boost of immunity you need to spend less time off the sick bed and more time staying active in the mode of exercise. Eating Vitamin C rich foods like lemons and oranges serves as a simple approach to boost immunity. As an immune booster, vitamin C is one of the standstill most preferred natural remedies for boosting the immune system serving as a preventative agent against many common disease. Women drinking warm water with lemon boast that that it gives a digestive boost helping your body break down food more efficiently. In fact drinking warm water with lemon in the morning is a craze. Some do it as a morning ritual. Others do it for digestion. What would you do it for? - Squeeze up some lemon juice first thing and the morning and start living out your cleanse diet. It doesn't matter whether you are considering the lemon syrup diet or the master cleanse, what give lemons their godlike cleansing power is that fact that it is a super strong natural diuretic. In short, lemons help you cleanse. Lemons are one of the most revered natural diuretics. In addition to the diuretic effect of lemons it acts as a laxative. Combining lemon diuretics and laxatives together is what makes it one of the choice foods in body cleansing. For best results, natural diuretic effect take lemon with warm or hot water in cleansing lemon juice. Lemons serve as an anti-inflammatory agent helping you deal with pain associated with inflammation. Considered a cornerstone of the anti-inflammatory diet, flavonoids in lemons are said to lower your body's levels of the inflammatory chemical, interleukin-8 helping to curb chronic inflammation. Drinking lemon juice in the morning may help keep up your lymphatic system. It is said to help with detox removing accumulated toxins in your lymph glands. The American Holistic Health Association (AHHA) recommended drinking freshly squeezed lemon juice mixed with water every day in the morning on top of eating natural diuretics (potassium-rich foods) like bananas and proper hydration. Eating lemons give you pectin that reduced the amount of dietary fat being absorbed by your body during digestion acting as a natural fat blocker. Lemons are rich in the fat blocking soluble dietary fiber pectin. However, before going into why lemon pectin is so special it is important to understand a little bit about pectin. What is pectin made from, anyway? - As it turns out pectin is a fiber found in certain fruits and vegetables that is used to made gelatin-like food as gams and jellies as a gelling agent. Fiber in lemons is sometimes called citrus pectin. What is citrus pectin? - As you would have guessed there are many sources of pectin including fruits and vegetables. Pectin from fruit may be classified as fruit pectin. Furthermore, pectin taken from citrus fruit may be called citrus pectin. Note that apple pectin is not citrus pectin. In the case of apples the term pome pectin may be used as apples are a pome fruit. You may be wondering, where can I buy pectin? - Although modified fruit pectin can be used to make jam as opposed to using natural pectin, let's take a step back. Is pectin natural? - Fractionated citrus pectin, just another term for modified citrus pectin may not be but as far as fresh lemons are concerned is doesn't get any more natural. Pectin help you block fat absorption. The gelling effect of pectin in your body helps decrease the absorption of dietary fat send fats that come in out of your body before being absorbed by your body. Lemons are said to help lower cholesterol. On top of containing no cholesterol, lemon polyphenols, flavonoids, and fiber may help reduce bad cholesterol reducing the risk of heart disease. Studies show lower liver cholesterol in rodents fed the soluble dietary fiber lemon pectin from lemon peels. Another study shows flavonoids have cholesterol lowering potential in hamsters. As for humans, bioflavonoids may impede the synthesis of cholesterol in the liver. When I first learned about the lemon diet my eyes lighted up with excitement. There's got to be something special about drinking lemon juice that I don't know about. It never came to me that drinking lemon juice warm is better than refreshing ice filled cold lemon juice. It just goes to say that it is better not to confuse the lemon diet with lemonade. The lemon diet is so simple that anyone can do it. What is easier than waking up in the morning to drink a warm glass of lemon juice for a healthier you? - Nothing is ever that easier. However, if anything it helps you develop the health lifestyle habit of waking up early in the morning to do some good morning stretches to loosen up rough edges around you shoulder blades. One thing I hope that everyone who is reading this to walk away with is that when dieting you should ask more from yourself instead of expecting your diet to do all the work for you. There is no magic wand for weight loss. What you put in is what you get and every little bit counts. Remember, you are always in control. After all, it's your diet. Just by drinking fresh fruit juice starting your day off first thing in the morning you comes away with enzymes for weight loss. Fresh fruit juice diet plan. What is a cleanse recipe with lemon? Get your fresh juice now and start mixing it up right away helping you to get slim knowing how to cleanse diet the right way. Simplest natural body cleanse that works to flush the toxins out of your diet just by taking on the watermelon detox diet not to mention time-warped antiaging benefits. Eating foods that help cleanse your colon is what the colon cleansing diet is all about. When it comes to restoring your detox ability there is no other. What is the best detox method only drinking water? That is the water detox diet in a nutshell. The rest is the right mineral water in your diet and timing.